NORWALK, Calif. – October 5, 2016 – Cerritos College’s fine art students can explore the ancient world on campus thanks to a donation of artifacts by former Cerritos College administrator John Grindel. Grindel served Cerritos College from 1995 - 2005 in several positions, including Director of Development, Dean of Economic Development/Contract Education and Grants, Executive Dean of Information Technology and Development, Vice President of Academic Affairs/Provost, and as Interim President/Superintendent. Grindel is re-gifting the artifacts to the College. Having received them from a friend in years prior who knew of Grindel’s interest in Near-Eastern pottery as a professor of Near-Eastern history. 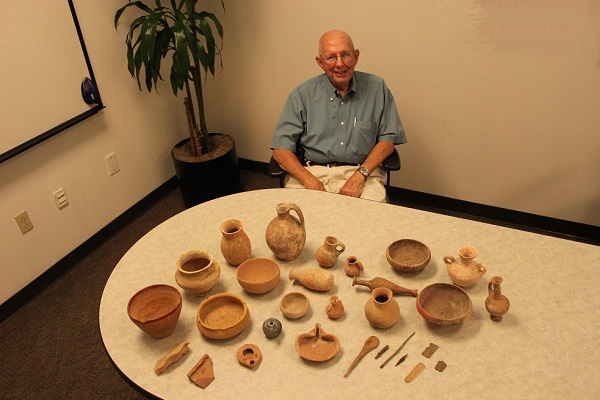 “In turn, it is my intention to pass on these ancient artifacts to a group of educators who would appreciate the beauty and importance, and the history of such common utensils in the lives of everyday people,” said Grindel. Grindel's generous donation of numerous ancient Near-Eastern ceramics will be formed into the John Grindel Antiquities Collection, and become a resource for art history, archeology, and anthropology instruction and student research. The collection includes 29 pieces from the Late Bronze Age and Iron Period (1500 BCE – 586 BCE) and pieces from the Greek and Roman era (332 BCE – 324 CE). The theme of the collection is how the ancients created light. Several examples of pottery used to create light are represented in the collection. Grindel’s generous donation will be named the John Grindel Antiquities Collection and will be on display in a dedicated section of the new Fine Arts Complex opening in January 2017. His collection will be a fresh resource for art history, archeology, and anthropology instruction and student research. The College will also add a new certificate program in museum studies in 2018. The artifacts will serve as a hands-on repository for learning proper care and display, and an archival resource for students in the museum studies program.